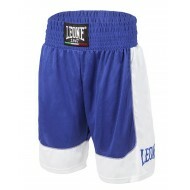 Train and compete in style and comfort with authentic Leone 1947 boxing shorts! 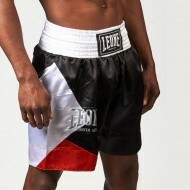 As well for girls, women, children, juniors as for men the many models of English boxing shorts will seduce you. 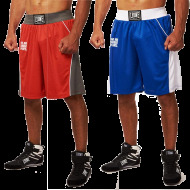 We offer our English boxing shorts in red, blue and black. From size XS to size XXL to suit all boxing boxers. 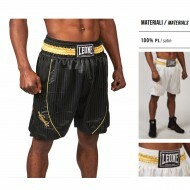 Boxing shorts are ideal for both training and fighting. The color codes are respected for the English boxing competitions. 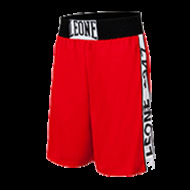 The Leone 1947 boxer shorts have a waistband that provides maximum comfort and a perfect fit without restricting movement. 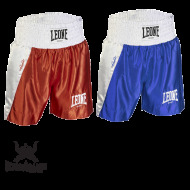 Materials of your choice between satin and polyester, allowing the boxing boxer to be comfortable in his movements as well in attacks as in defenses. 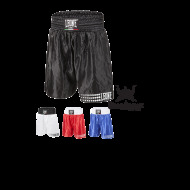 Some of our boxing shorts are short and others longer (below the knees), making it possible to seduce the greatest number of boxer and find his proper style. 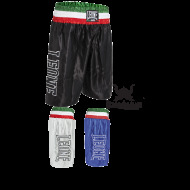 With our 1947 Leone 1947 boxing shorts, you will find shoes on your toes and have a great style on boxing rings. 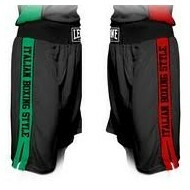 You will stand out from your competitors and may even if you wish to have a custom boxing shorts. 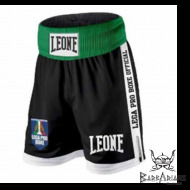 Indeed, if you send us your logo in good quality, we can put it on your shorts with techniques like flocking, embroidery, sublimation or silkscreen to allow you to have your own custom boxing shorts .